In the summer after my eighth birthday, my parents brought me to Yankee Stadium for the first time and gingerly explained that the building in which we sat had been built way back in 1923. “That was before either of you were born!,” I exclaimed with remarkably adult grammatical structure. Weeks later, a Hastings-On-Hudson village program of some sort sent a busload of us kids to the upper deck at Shea Stadium. I looked around in the greenish lighting, at the cracked cement, and the rusty bolts, and the overhead fixtures that looked like our back porch light at home, and the building that vibrated in the wake of the jets overhead, and told the adult that if Yankee Stadium had been built in 1923 as my parents said, Shea Stadium must’ve been built in 1886. Shea was three years old at the time. It is in that context in which the Mets’ new home must be judged. 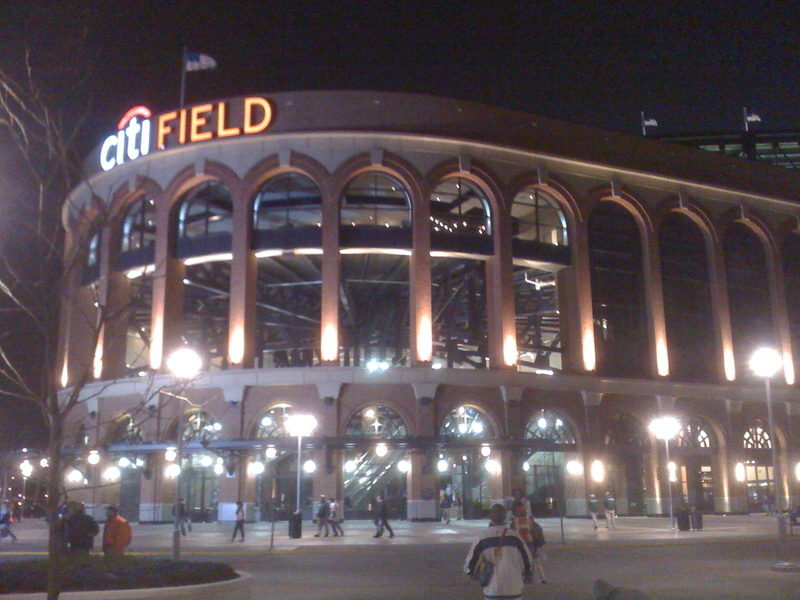 The first 100 most important facts about CitiField are identical: it ain’t Shea. While the now-leveled stadium was a genuinely praiseworthy attempt to mix civic expenditure with private business, and use modern technology to build a facility suited to both football and baseball, it was a dump from day one. Thus, yes, apart from the marvelous “Ebbets Field Wrapper” that reduced to tears a friend of mine who once had season tickets to the original, and apart from the Rotunda that Bud Selig said he came to this game to see (and he saw the original), it is Coors Field plus Jacobs Field plus Citizens Bank with a few echoes of the Polo Grounds and Tiger Stadium in the overhanging rightfield porch. But it ain’t Shea. 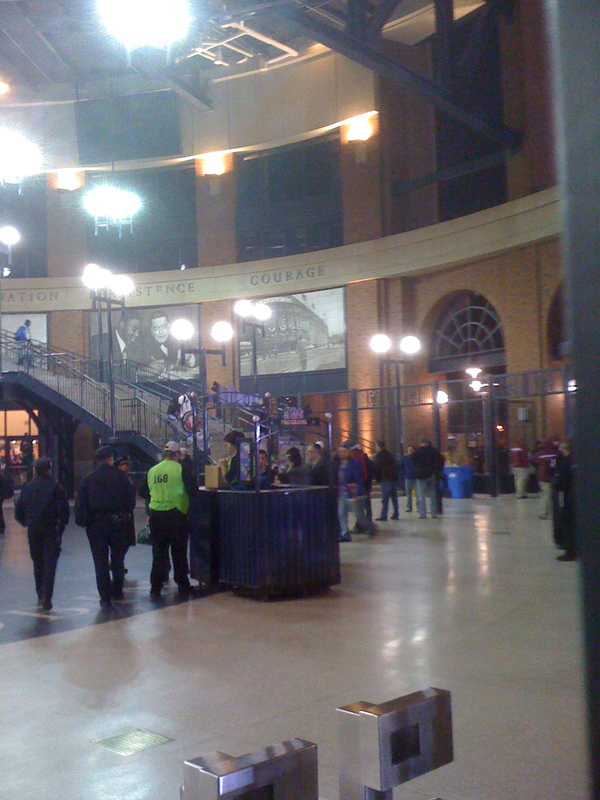 Also, that Rotunda looks very retro at night — especially with Rickey and Robinson on the wall there. 8. The Mets’ first game in their field featured a hold by Duaner Sanchez (released by the Mets last month), and a save by Heath Bell (traded by the Mets in 2006). 7. Somebody decided that the best way to christen a ballpark replacing a stadium notorious for 45 deafening seasons in the flight paths of LaGuardia was to have a military jet flyover complete with near-sonic boom. 6. The home team’s starting pitcher fell off the mound with two out in the second, laughed it off, and proceeded to give up four straight hits, including the opposing starting pitcher’s first in the big leagues. 5. That other pitcher to christen the ballpark, Walter Silva, was not listed in the Padres’ Media Guide and his biography had to be disseminated to the media via a photocopied sheet. 4. In an almost literal case of opening night jitters, the game was decided when the eminently reliable Ryan Church dropped Luis Rodriguez’s fly for a three-base error, and then Rodriguez scored on a flinch of a balk by Pedro Feliciano. 3. New York Mayor Michael Bloomberg got a foul ball off the bat of Fernando Tatis in the 9th Inning, even though he was sitting behind the home plate screen. 2. Six innings earlier, a stray cat desperately trying to exit the field leaped onto the low fence directly in front of New York Governor David Paterson. 1. The first batter in the first inning in the first game in CitiField, Jody Gerut, homered – the first time in baseball history a new stadium has been so christened.